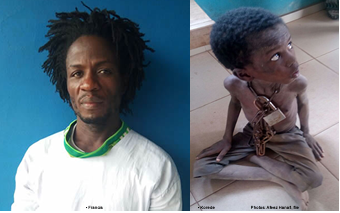 Francis Taiwo, a Celestial Church of Christ pastor who starved and kept his nine-year-old son in chains for months, has been arrested. The 40-year-old pastor was apprehended by the police from the Onipanu division on Sunday at his church – CCC, Key of Joy Parish – in Ajibawo, Atan, in the Ado-Odo/Ota Local Government Area of Ogun State. Korede was, however, rescued on Friday during a joint operation by the Nigeria Security and Civil Defence Corps and the police, after receiving a tip-off from residents of the area. Korede’s stepmother, Kehinde, had also been arrested for allegedly aiding the cruelty meted out to the boy. Korede, who said he aspired to be a doctor, had blamed his father for his stealing habit. “It is true that I stole a pot of soup and a bowl of eba in our house. I also stole in the neighbourhood. My father’s inability to give money to my stepmother for the upkeep of the family caused it. When I was chained, my father and stepmother fed me twice a day. Some days, I was not given any food. I want to go back to school because I want to be a doctor in the future. I do not want to go back to my father’s house,” Korede had said. Francis, a father of five who hails from Benin Republic, confessed to the act in his statement to the police, adding that Korede’s mother was late. A resident, who identified himself only as Elijah, said Francis had been warned on several occasions against unleashing violence on the victim. The Ogun State police spokesperson, SP Muyiwa Adejobi, said the case had been transferred to the child labour unit of the command for investigation. “The case has been transferred to the Anti-Human Trafficking and Child Labour Unit of the command for necessary investigation and actions as directed by the Assistant Inspector-General of Police in charge of zone 2, AIG Abdulmajid Ali,” he said.